Well, after after a few complications in my travel due to Columbus Day (The Marc trains weren’t running, and the Metro’s Orange line was farked), I made it to Arlington. After a fairly successful meeting the next day, I decided it would be a good opportunity to meet up with some of my DC area friends, and we decided a nice, large gathering at Kabob Bazaar in Clarendon for, well, kabobs, was in order. Of course, it’s never that simple. Mere minutes after leaving my meeting by Virginia Square, someone jumped/fell in front of a train at the Clarendon station, which essentially took out the entire Orange line between Ballston and Rosslyn in both directions for a while. So several people had to bail. And I had to walk from Ballston. Shortly after our appointed time, my friends Steve and Ally (both guest stars of previous DC-area Offbeat Eats outings) showed up, with Steve having Lou (a mutual online acquaintance) in tow as well. About 45 minutes of waiting at Clarendon, watching the most impressive assortment of emergency vehicles (at one point I counted 15 emergency vehicles with flashers, plus almost a dozen Metro authority civilian vehicles of all sorts), we finally decided that everyone that was going to make it had shown up, so we got seated. 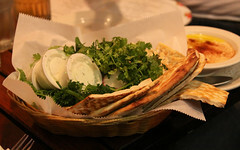 Like most self-respecting Persian places, Kabob Bazaar has a pretty good bread basket, loaded up with many slabs of Persian flat bread and a small mountain of sabzi greens. The bread was the sort of Persian bread that has an almost cracker-like consistency, so I actually find it’s best to let the juices from your kebab soften it up, but it also went really well with the hummus we ordered. Speaking of which, I was rather pleased with the hummus here (no pictures, since hummus doesn’t generally photograph well, being a paste), it was pleasantly garlicky, with a good, soft creamy consistency instead of the slightly chalky stuff I get most places. 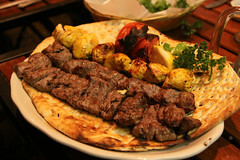 Kabob Bazaar has your basic Persian menu, featuring a wide variety of kabobs in chicken, lamb, and beef, including barg (meat marinated in olive oil, onion, garlic, saffron, and black pepper) and koubideh (minced meat with onions and spice). Looking over the available options, I ended up going for the Bazaar Combo, which was three skewers (one each of chicken, beef koubideh, and beef barg) served up on bread. I rather liked this combo plate. All three kabobs were grilled perfectly, with just enough sear to give it some real grilled flavor, but not over-cooking it nor drying it out. The seasoning of all three was good as well, with the koubideh having a particularly good onion note to it. The Barg still had a nice meat grain structure to it; often I find these sorts of dishes have been over-marinated so that the proteins go mushy, but that wasn’t the case here. And the chicken had a particularly good saffron and lemon tang to it that made it pleasant. As the juices from all of these soaked into the bread, it made for a particularly nice little snack as well. My only regret? Kabob Bazaar also seems like the sort of place that would have really good rice, so next time I’ll have to get the combo with rice instead. It’s also worth noting that Kabob Bazaar has a good number of weekly specials, some of which look pretty good. 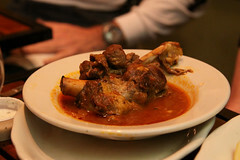 Instead of getting kabobs like the rest of us, Ally got the Tuesday dinner special, which was a roasted lamb shank. When seeing it arrive at the table, I almost had “menu regret”. In any case, I was thoroughly pleased by Kabob Bazaar. The food was excellent, the location convenient, the staff pleasant (they had noticed that I had spent almost an hour milling around out front waiting for people), and the prices reasonable. I’ll certainly think about coming back here on a future Arlington trip. Mentone…. there’s a name I haven’t heard about, or been, for a long time (since my brother was stationed at Fort McClellan in Anniston, AL). Lots of great eats down that way, so I do need to find an excuse to go visit NE Alabama again. Will add Wildflower to my hit list.